Human Factor IXa - Bovine Factor IXa - Haematologic Technologies, Inc. The activation of factor X by the intrinsic factor Xase complex is shown. The intrinsic factor Xase complex consists of an enzyme, factor IXa, and a cofactor, factor VIIIa, assembled on a phospholipid surface in the presence of calcium ions. The enzyme complex proteolytically cleaves a 10,000 molecular weight activation peptide from the NH2-terminal of the heavy chain of factor X, thus expressing the active-site of factor Xa. Factor IXa is produced from its inactive precursor, factor IX, via proteolytic cleavage by factor XIa or the tissue factor/factor VIIa/phospholipid complex. The activation results from the cleavage of two peptide bonds in the factor IX molecule, releasing an activation glycopeptide with an apparent molecular weight of 10,000. The heavy chain of factor IXa (Mr=28,000) contains the serine protease catalytic domain, while the light chain (Mr=17,000) contains the membrane binding domain. Factor IXa functions as a serine protease involved in the activation of the zymogen, factor X, to form the enzyme, factor Xa. The factor IXa enzymatic activity is greatly enhanced by inclusion of its cofactor, factor VIIIa, in the presence of calcium ions on a phospholipid surface. Factor IXa is readily inhibited by antithrombin III, and this inhibition is greatly accelerated by the presence of heparin. Factor IXa is not inhibited by DFP. Factor IXa is prepared from highly purified factor IX by activation with factor XIa, as described by Lindquist et al. (5). 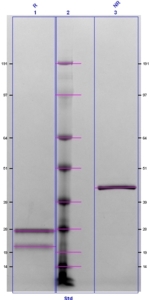 The factor IXa is further purified by gel filtration, followed by immunoaffinity purification. Factor IXa is also available with the active site irreversibly blocked by the tripeptide chloromethyl ketone, EGRck, or by the fluorescent inhibitor, Dansyl-EGRck. It is supplied in 50% (vol/vol) glycerol/H2O for storage at -20°C. Purity is assessed by SDS-PAGE analysis. Activity is determined in a one-stage clotting assay. 1. Thompson, A.R., Blood, 67, 565 (1986). Hedner, U., et al., In Hemostasis and Thrombosis, 2nd edition, ed. R.W. Colman, J. Hirsh, V.J. Marder, E.W. Salzman, pp., 39-47. J.P. Lippincott Co, Philadelphia, 1987. Lindquist, P.A., et al., J. Biol. Chem., 253, 1902 (1978).